A holarctic genus or complex of genera with some species ranging into subtropical China. 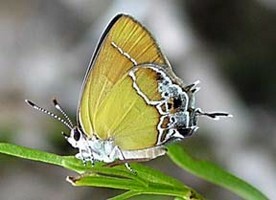 Holarctic genera such as Callophrys are the subject of much disagreement regarding circumscription. The inclusive arrangement followed here is that of Robbins (2004), but it is evident that the green hairstreaks of Callophrys s. s. are quite distinct from the elfins ("Incisalia"), and so clearly a comprehensive analysis of relationships is needed. Page: Tree of Life Callophrys Billberg 1820. Incisalia Scudder 1872 currently viewed as a subjective junior synonym, Mitoura Scudder 1872 currently viewed as a subjective junior synonym, Green Hairstreaks and Elfins. Authored by Andrew V. Z. Brower. The TEXT of this page is licensed under the Creative Commons Attribution License - Version 3.0. Note that images and other media featured on this page are each governed by their own license, and they may or may not be available for reuse. Click on an image or a media link to access the media data window, which provides the relevant licensing information. For the general terms and conditions of ToL material reuse and redistribution, please see the Tree of Life Copyright Policies.